Last weekend I was on vacation with my family at Daytona Beach. Sun, sand, waves: serenity. On the first morning I awoke early at 6:30 a.m. I put on my clothes, grabbed my cup of coffee, and headed downstairs and out the door to view a local attraction, no money needed. As I arrived on the beach, there were a few other people with the same idea, cameras in hand. It was cloudy and overcast, but I was determined to wait and see the sun rise, quietly over the crashing waves. A brilliant red-orange ball of fire, bursting through the horizon! In my lifetime, the sun has risen and lighted my day over 17,000 times. A constant reminder of God’s faithfulness. “From the rising of the sun to its setting, the name of the LORD is to be praised!” (Psalm 113:3) On the second morning, I arose early again, went into my daughter’s room, and whispered “Sarah, wake up”. She rolled over and said “Is it worth it”? She closed her eyes and chose to stay horizontal a couple more hours. I went out the door, downstairs, and back to the bench I sat at the morning before to view God’s wonder. “Yes, it was worth it, ” I thought. Once the veil has been removed, and we see his glory, the transformation work begins. The transformation’s purpose is to be like Christ. Light bearers. Mirrors of His glory. When people see us, they are to see God’s image. This is to attract them to the Light. Not the physical light blinding glory that Moses, Peter, James, John, and Paul experienced. But the inward character traits of the fruit of the Spirit: Love, Joy, Peace, Patience, Kindness, Goodness, Faithfulness, Gentleness, Self-Control. We cannot be Christ-like without first worshipping and adoring Him in the quiet and stillness. Watching the Son rise in our hearts, as we die to self, daily. We pick up his Word, like a mirror ,and hold it up to our hearts as we read it . We ask the Holy Spirit to transform us to be like Jesus, and plant the fruit of the Spirit in our lives. Like the mirror- like building above, we are meant to reflect God’s Light, and His image. 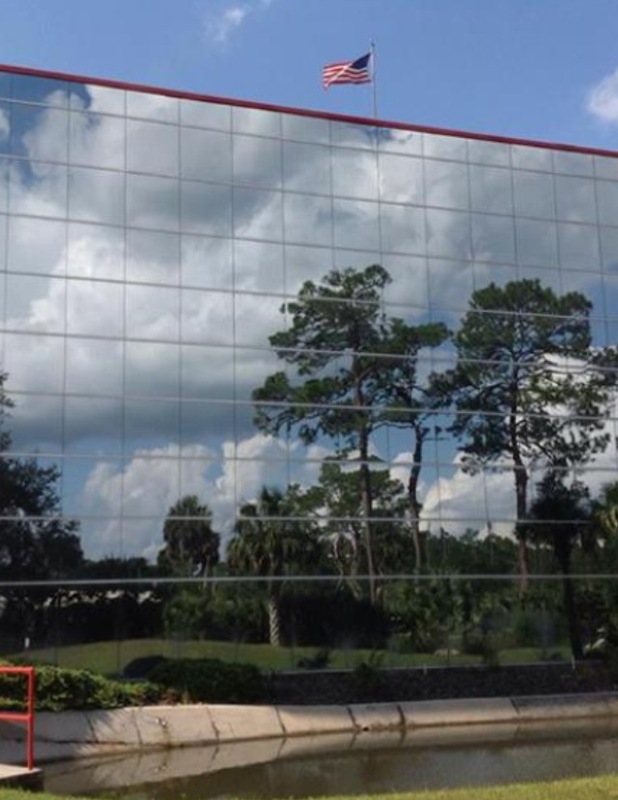 The image you see on this building is the reflection of other objects in close proximity. The beauty of the building is only in the reflection of the objects, outside of itself. Without the image it reflects, it would be rather ordinary and just a building. But as a reflector, it shows true beauty. When we behold God’s glory, and walk in His light, His image and character begins to grow in our hearts. People around us will start to see God’s reflection, (peace, love, joy, kindness, patience) because we’ve been with God, face-to-face. Our self-will and sin nature will die a slow death, as we are transformed into His image. God wants us to be Son Gazers, and Son Reflectors. We can’t be Son Reflectors without first spending time gazing at the Son, in His presence daily. It’s only when we reflect His light back outward, onto the paths of those around us, that they get a glimpse of the Son, and the veil starts to move on their hearts. The more light they see, the more attracted they are to the Son, and they start to turn toward the Light Giver, and He reaches to their heart to lift the veil. This entry was posted in Transformation and tagged Holy Spirit, Jesus, Light, Moses, Sunrise, Transformation. Bookmark the permalink.